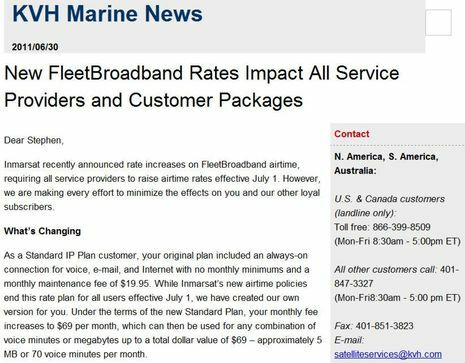 Inmarsat FleetBroadband airtime changes, bad news for the little guys? So let’s start with known facts. In late June, as shown in the screen shot above, KVH notified customers that Inmarsat “rate increases” required all service providers to raise airtime rates effective July 1. Specifically, those subscribed to the minimum $20/month maintenance plan (with pay-as-you-go service at about $1.50 a minute and $13.75 a megabyte) would be switched to a “Standard” $69/month plan that includes $69 worth of data or voice at somewhat lower minute/megabyte rates. Which might be fine if you’re cruising much of the year, but not so much if your boat is hauled out. Another shock for folks who only use their Fleet Broadband hardware irregularly was the end of the policy that let you consume a whole year’s worth of monthly plan data and voice whenever you wanted if you prepaid the entire year. The marine electronics dealer/installer who first told me about this situation feels that “this will completely orphan the recreational community” and he included an email from a customer who had already cancelled his service. But when I contacted Inmarsat to ask about the changes, they professed surprise at KVH’s statement and claimed that in fact they’d lowered wholesale airtime prices to their distributors. Argh! 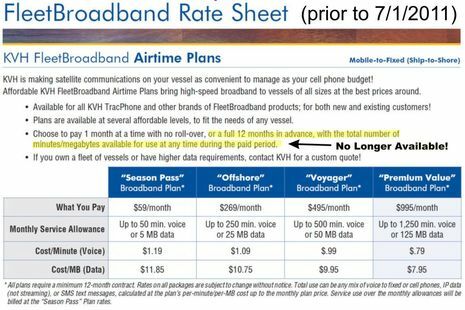 And actually if you look at the other plans KVH introduced on July 1 versus the old plans shown below, you’ll see that the “implied rates” for the included minutes and megs are inexpensive compared to the past (but watch out for those increased “out of plan” data charges). So perhaps KVH should have phrased it “rate policy changes” instead of “increases” but I’m not sure that will make much difference to folks paying the bills. But then there’s the question of whether Inmarsat itself changed the policies, or Stratos (who distributes airtime to KVH), or even KVH itself (which, mind you, also somewhat competes against Fleet Broadband with its mini-VSAT service). I’m not positive, but I think Inmarsat itself precipitated these changes, largely because of service provider news found on this Stratos page (and, mind you, Stratos is owned by Inmarsat…oh, the complications). I’ve also heard that other service providers have changed their airtime rates like KVH did, though I can find no evidence of that on the Web. Interested readers may be able to help with that research, and if someone finds an occaisional-user-friendly FB plan, they will be much appreciated. I also think it is outrageous that Inmarsat is able to so significantly impact the cost of using a very expensive piece of hardware. The $12k domes people have will not be practical to operate and in the mean time, us dealers look like asses for selling it to them! There may be more to this story than I’ve yet uncovered, but I trust that we can get to the bottom of it together. For instance, I know that Gram Schweikert, FB150 and OpenPort tester extraordinaire, is also investigating (between boat projects in NZ and a delivery to Vanautu). In fact, he recently wrote an expert and careful comparison of bluewater communications options and costs that’s already gone to press for the September issue of Cruising World. An online addendum here and at CW is probably going to be necessary! Inmarsat, boxed in by attacks from all sides? Looks like they may have hired a CFO from the cellphone data services industry. Only last week I have inquired about satellite data and voice options for our planned 18 month sabbatical. Between the handheld phones I was told to go with iridium as the initial cost is the same for a package of phone, dock and external antenna and in spite of the higher per minute cost, I would come out ahead on Iridium for data (our primary use) because of faster connection time and better throughput on iridium. I was also told, and had picked up from Gram’s articles, that FBB would be a more economical solution for our needs if it weren’t for the equipment cost. For a few days I had considered buying a new FBB terminal and selling it on ebay at the end of the trip. 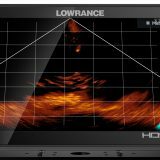 As I would assume that the price of used terminals on ebay has just dropped by a couple of thousand dollars, that is no longer an option worth investigating for me (so again some very relevant information at the right time – this is a really useful resource in case no one has ever told you before ;-). Now I guess I will just check ebay for a few weeks before the Iridium purchase if some poor guy is desparate enough to sell his FBB terminal to me at the cost of an Iridium 9555 plus dock and antenna. Interesting timing as I’ve had several extended discussions here with cruisers using various communications products and what was most cost effective. For pure data the Fleet 33 or BGAN service is cheaper than Iridium (handset not broadband) since you only pay for the data you transfer, not the minutes you use. Since Iridium is very slow (9600bps before overhead) and the charges are rounded up to the next minute, it’s easy to run up an Iridium bill with daily downloads of modest amounts of data (no web surfing). The flip side is that the guys using Fleet 33 or BGAN are constantly fighting their computer’s desire to download all kinds of stuff. 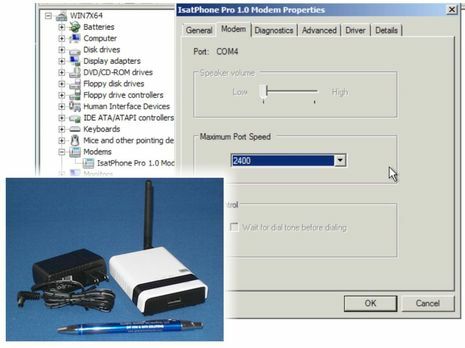 The broadband connections look to your computer like any other internet connection. Computer software is now written to almost assume it will have an internet connection. While you may only want to download some GRIBs, once your computer sees the connection, every piece of software on your computer decides to “call home” and all kinds of traffic is initated that you never see. These billing changes may swing things back towards Iridium, but neither is really a good solution. The bottom line seems to be that these services don’t really want small customers. 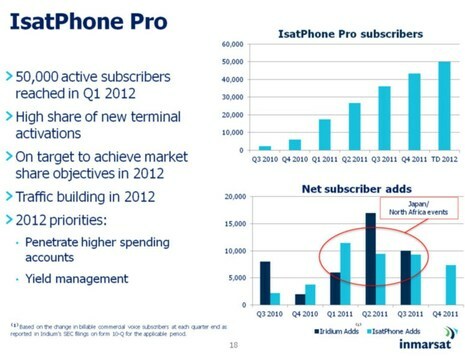 In cellular lingo, they want an ARPU (average revenue per user) north of $500/month. I need to confirm the details of the new billing method with KVH, but my initial reading of the new rates would mean a small increase in the annual cost on Visions of Johanna (based on actual data and voice usage from last year which is detailed in my upcoming Cruising World article). As Ben mentioned, while the initial rates for the packages have gone down, the overage rates have skyrocketed so unless you happen to fit exactly into one of their new plans (unlikely as the choices jump from $79/month to $299/month) your overages get pretty expensive. For the 4 month a year season that most of us are stuck with, the new pricing scheme is basically unworkable. Hopefully people will make some noise and Inmarsat will roll back these decisions or provide some reasonable casual or seasonal usage options. In the meantime, Iridium Openport looks like it may be a better option if you can fit the somewhat bigger dome. I have a feeling this is to drive customers towards KVH’s new mini-VSAT V3 dish/airtime. However, the almost $9,000 cost difference in hardware, and bigger dome size, still make the FB150 a choice worth looking at, in these muddy (expensive) waters. That’s true. There are some ways to prevent that, but I haven’t found anything perfect. All solutions require positive filtering of the sites you need to access (and filtering out the others). Currently, I do it by only allowing the DNS lookups I know are needed. It’s relatively simple and it has cut down my bandwidth usage by a sizable amount. For services I need all the time (for example email), I set the relevant software with the IP address instead of the hostname (for example, the IP of the SMTP server). Inmarsat is expensive. Unfortunately, they are the only ones who can provide both a usable bandwidth and a (almost) global cover. Iridium is truly global but the bandwidth is inadequate. Other systems, including mini-VSAT, are not global. Hi Pandora. When you have a chance, you might find the mini-VSAT Broadband coverage is larger than you expect with seamless coverage around the globe. An easy link to the current map is available at http://www.minivsat.com. We also announced a few weeks ago that the remaining South American coverage is now under contract and going live in a matter of weeks. The challenge for many of KVH’s customers is that they enjoy mini-VSAT Broadband, which offers faster data rates (2 Mbps downloads and up to 512 Kbps uploads) and lower airtime and voice costs than Inmarsat, for everyday use while still retaining their original Inmarsat system as a backup solution or for those rare times when they might leave the global mini-VSAT Broadband coverage area. With the original Inmarsat plans, subscribers could have the low admin fee and then simply pay for service on those limited occasions when they used it or, as Ben and Gram point out above, prepay for the year and use 12 months of service in a condensed period of time. Unfortunately, the new plans remove a bit of that flexibility and increase the basic per-month cost (as well as the out-of-plan costs) though the new plans do include an airtime, voice, and SMS allowance, which might make boaters more likely to use their Inmarsat systems rather than have them sit idle and not risk an unexpectedly high bill. As a disclaimer, I’m an employee of KVH and the KVH rate plan information both for Inmarsat and mini-VSAT Broadband services discussed here is publicly available at http://www.kvh.com/inmarsatairtime and http://www.kvh.com/mvbservice respectively. Does Inmarsat’s new pricing policy affect airtime charges for their iPhonePro (which allows the pre-paid purchase of airtime minutes through a “card” (at about $0.90 / min for 100 minutes) that requires no monthly plan? Also regarding iPhonePro (sorry if this is too far off topic), apparently they have just come out with a blu-tooth handset (with lots of buttons and a screen) that allows remote use (the iPhonePro can stay outside, in the elements in order to get a direct sky view, while the user can be comfortably inside. They claim it eliminates the need for a docking station, but it seems that it may also solve the problem of an overly-small and dim screen. How about a review? Don’t buy Fleetbroadband ! it is way too expensive for something that provides the same service as BGAN. Just get a portable unit like the Wideye and subscribe to a normal BGAN service. It works fine !!! Been using it for two years, just point the antenna and don’t worry about the roll … It even works when swinging on a mooring ! Just don’t tell inmarsat, they don’t like us using BGAN at sea … We’re only paying the “normal” rate, not the “Fleetbroadband” rip-off ! 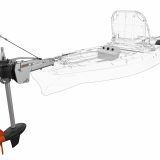 This is based on my own personnal experience, using this product constantly for the past 3 years, i am not a week-end sailor, i live aboard my boat in Asia and BGAN is my main way of using emails , getting news and weather forecast from the internet. In 2008, during a Hong-Kong to Philippines crossing, when caught in Typhoon FENGSHEN, i downloaded hi-res sat pictures of the typhoon once every hour and was able to stay safe because of my BGAN unit. If it works in this kind of weather , it’ll work everywhere ! And use a filter when online, like LittleSnitch (Mac OsX), to prevent your computer to download unwanted files. Ben, living aboard in Asia for the past three years, currently building a 45ft catamaran in Thailand. 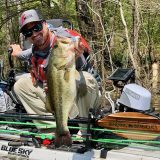 BenBen – Have you ever tried using BGAN while underway? Check my blog, http://www.blogatrip.com , all pictures taken aboard, including the june 2008 post on the typhoon which was done in 5 meter waves, were uploaded underway. Sorry, it’s a little late to reply to this, I was underway between Japan and the US (typhoons, severe gales, etc.). Unfortunately, mini-VSAT coverage doesn’t include the South Pacific. I could deal with no coverage in the South Indian and South Atlantic, but no South Pacific? And it looks like the Marshalls and Micronesia aren’t covered either. These are prime destination for me (among many others). That’s really the only reason I won’t switch. You have an excellent point. We’ve pretty much completed our original network rollout plan and are now looking ahead toward future needs for hardware, services, the possibility of expanding coverage, etc. We’ve found that quite a few boaters who have a need for the speed and bandwidth afforded by VSAT are adding a TracPhone and mini-VSAT Broadband as their day-to-day service due to the speeds and lower cost. At the same time, they are keeping their existing Inmarsat onboard as a backup and for those times when they cruise outside the current mini-VSAT Broadband service area. When they do, they just alter their usage to avoid extensive web browsing, etc., to avoid running up the Inmarsat airtime costs. However, we recognize that such a solution isn’t ideal for everyone either due to budget, primary cruising areas, or data requirements, which is why we’re very happy to also offer Inmarsat-compatible TracPhone systems, Inmarsat airtime, and outstanding technical support for boaters who prefer to stick with Inmarsat. FleetBroadband users who want to be able to shut down service when they’re not using it should check out Intellian’s FB service plans, which are monthly without shut down or restart fees.